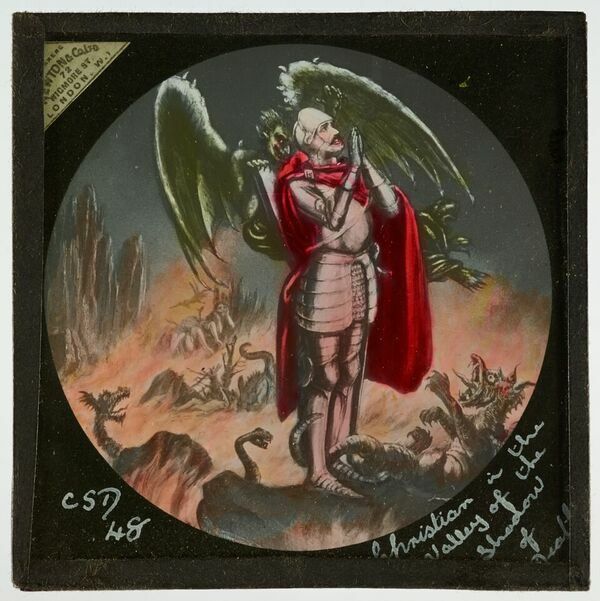 I am pleased to announce the completion of the digitisation of the lantern slides donated by Echoes of Service to the Christian Brethren Archive. A total of 901 slides are now available to view via the Manchester Digital Collections site and have been catalogued by John McCrory and Jane Donaldson, who provide below a description of their experiences on the project. For the last month, Jane and I have been cataloguing a fascinating collection of lantern slides from the Christian Brethren Archive, featuring an array of photographs, bible studies materials, verses from hymns and maps, all giving a broad insight into the mission work performed by members of the Christian Brethren. 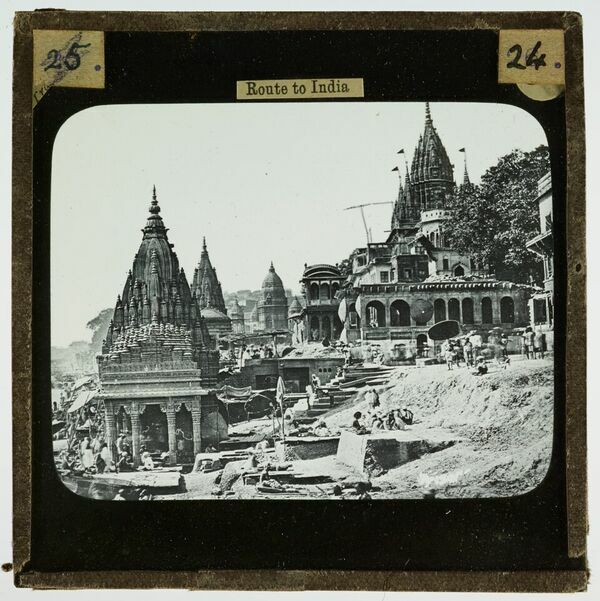 My focus was primarily on the slides containing illustrations of bible studies, along with two boxes condensing The Pilgrim’s Progress, and I also covered two boxes of slides featuring photographs of China and India. The process for dealing with the separate themes was quite different. I began with the two boxes of slides telling the first part of John Bunyan’s Christian allegory, The Pilgrim’s Progress, (a book I have since been inspired to read!) Through a dramatic series of illustrations we follow Christian’s journey to the Celestial City, and his encounters with all manner of characters (Evangelist, Pliable, Mr. Worldly Wiseman etc.) and places (Vanity Fair, Slough of Despond, Valley of the Shadow of Death). These materials would have been used by mission workers on their travels, and it quickly became clear to me how much of an impact these stories must have had on their audience. 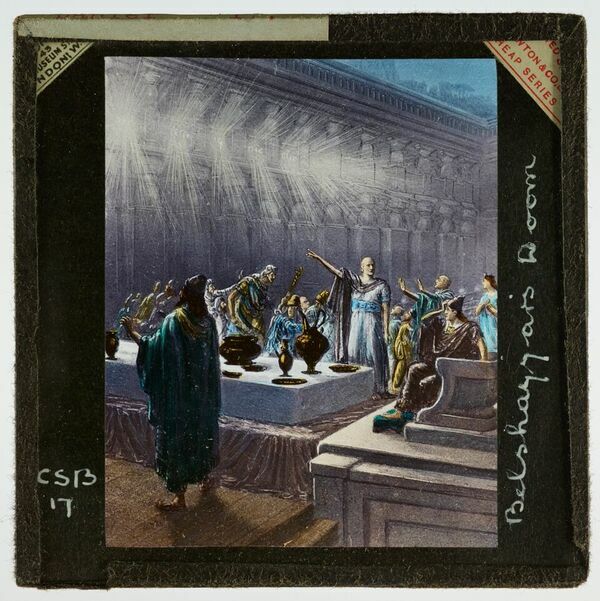 Startled guests at King Belshazzar’s feast pointing at the illuminated writing on the wall, foretelling the King’s doom. The slides often had labels with a title listing the main characters, sometimes elaborating on their location or current predicament. After noting this I would look through the text of the original work, finding details on the other characters in the scene, or giving additional context to the illustration. It was a similar process for the other illustrated slides, covering the lives of the prophets Daniel, David, Elijah, Elisha, and the parable of the prodigal son. The only difference was the source text; The Pilgrim’s Progress was replaced by the Old Testament. These illustrations were equally vivid, and it was a delight to be reminded of many dramatic passages from the Bible, with the images portraying scenes such as ‘the writing on the wall’ foretelling King Belshazzar’s doom. While in each series the slides worked as a coherent narrative, the works of different illustrators or artists were occasionally mixed together. The slides portraying the life of Daniel contain two paintings by the artist Briton Rivière, one of which, Daniel’s Answer to the King (1890), is held by the Manchester Art Gallery (EOS/4/1/11/3). Very occasionally, printed labels on the slides would inform us of the artist directly. One such is an image of ‘Elijah and Ahab’ (EOS/4/1/11/41), with the label stating the illustration comes from Harold Copping’s The Gospels in the Old Testament. Slides from The Pilgrim’s Progress occasionally feature printed labels indicating they were issued by the Religious Tract Society, which again suggests that Harold Copping was the artist responsible for many of these images. I was also fortunate enough to look through two final boxes of slides with photographs from both China and India, taken by mission workers. 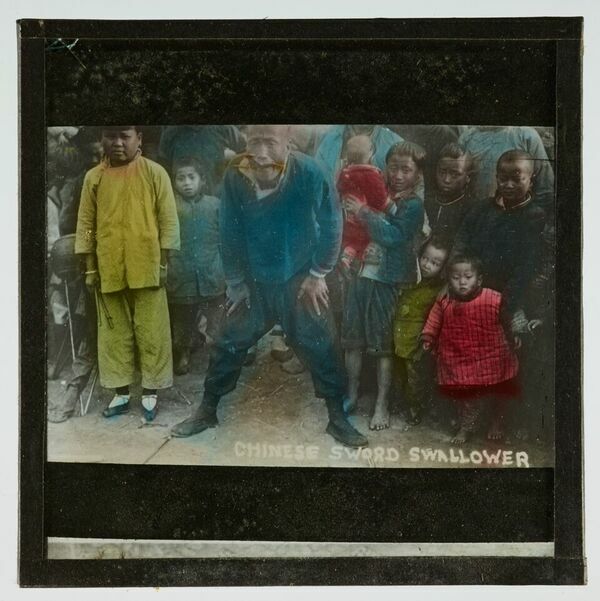 These photographs, some of which were in colour, covered a tremendous number of themes. These included images documenting mission work, showing groups of scholars and (one presumes) worshipers. There are photographs of rural and urban China and India, containing fascinating examples of local homes, dress, and working lives; scenes of religious temples, rituals and processions; and what we might describe as ‘tourist’ shots, showing landmarks such as the Taj Mahal, and the city walls of Mukden (modern-day Shenyang). Photograph showing several large temple buildings at Benares Ghat. Alongside these photographs were slides featuring maps of the countries visited by the mission workers, verses from hymns, and annotated illustrations with texts written in the local script, and conveying the Christian message. Some of the photographs were a complete puzzle. I was unable to determine whether the scene in, say EOS/4/1/8/25, was a ritual punishment- even a form of public execution, or something more innocuous and less violent. 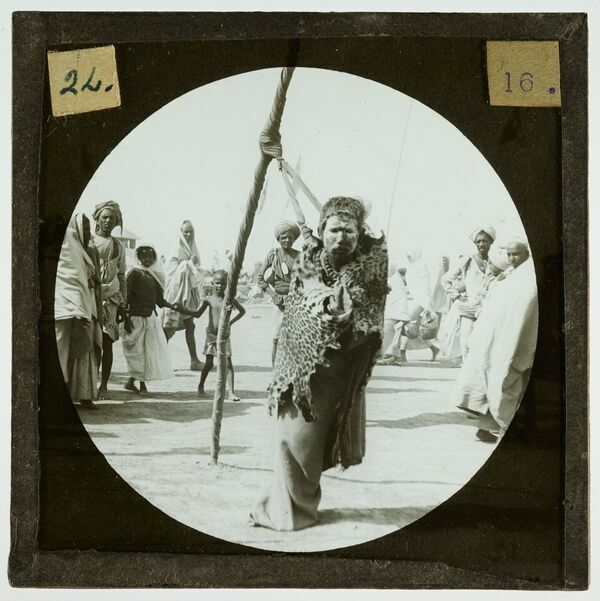 Man bound, cloaked in animal skin and tethered to pole. While a few of these slides contained brief titles, cataloguing them was more often a case of describing the image as clearly as possible. This presented unexpected difficulties, and I was reminded of my own inability to distinguish between, say, an ox, a bull and a cow; a donkey and mule; a horse and pony, and other such things. Without a description of the regions featured in these photographs, we were unable to make any suppositions about the local people and their religion, dress and other aspects of their culture. My descriptions are therefore as pared down as possible in a deliberate attempt not to misrepresent the material. We would welcome the addition of any further information on these superb photographs, capturing a world which was soon to undergo dramatic change. As part of my ongoing volunteering at Special Collections, I have been working again with Jessica Smith, Archivist for the Christian Brethren Archive, helping to catalogue and research items within the collection. 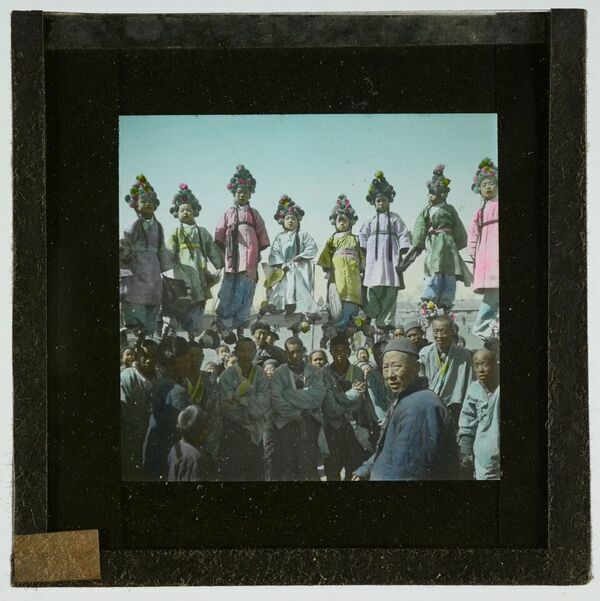 My task has been to add catalogue descriptions to the lantern slides prior to their being added to Luna, the University digital image collection. The slides I worked on depict the life of mission workers in various countries including India, Rural China and Africa, and are dated roughly as from the early 20th century. Some of the slides are hand-coloured and some are black and white, some have labels on them and a couple had notes inside their boxes, including a running order of slides for a presentation and dates, which indicate that the slides were shown by the mission workers after they had returned home in the 1950s. They were used to highlight mission work abroad and to illustrate a world that many people would not have had knowledge of. The slides come from a time when Britain wielded vast colonial power. The first slides I looked at were labelled as being from rural China, but this was the sum total of the information provided. Included are posed images of groups containing different generations, and are possibly families. 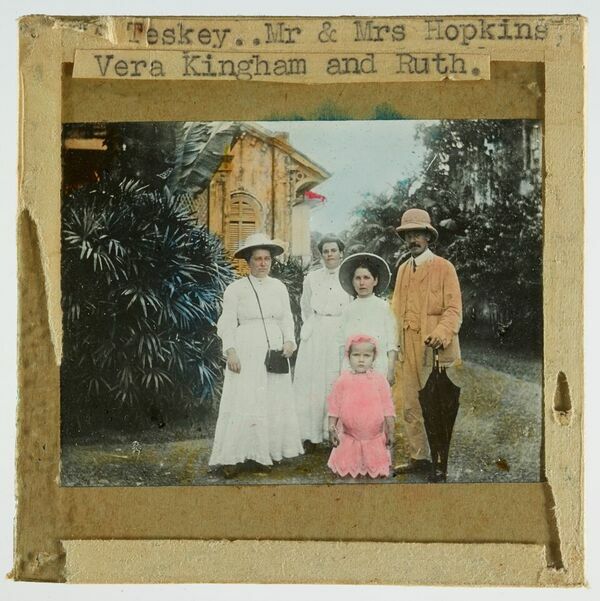 Photographs include people in traditional dress but also in more modern western clothing of the time, and several group shots of children. Although the slides are mainly of Chinese groups and activities, there are a couple of pictures which include Westerners who are likely to be the mission workers. 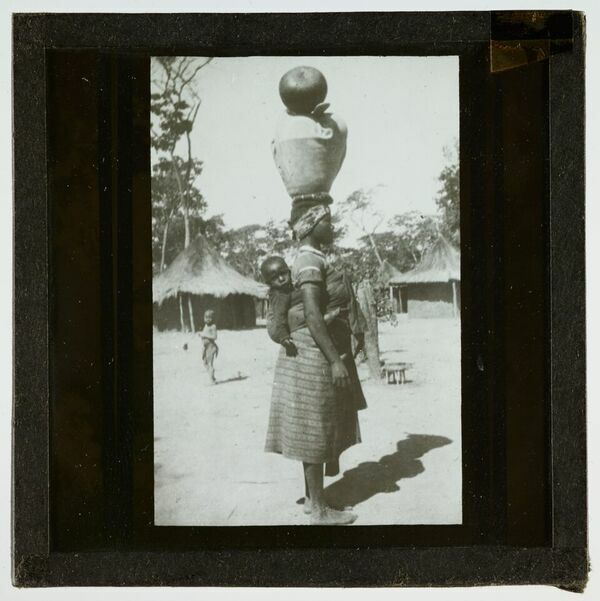 Everyday activities of people that may be unusual to westerner eyes are documented, including ploughing, making food, taking tea, travel in Sudan chairs, and funerals as well as the more unusual such as sword swallowing, fetish sticks and religious rituals. It was interesting to see that the mission workers had made a record of examples of other religions and rituals that were performed across the globe. Images of architecture include Brethren churches, Mosques, and the houses built for mission workers. Another slide from Africa was labelled ‘Palava shed’, which I found referred to a structure featuring a roof but no sides, used by villagers to talk to each other in the shade. A set of slides from Africa show that missionary work included helping with the health of the communities they worked in. There are photographs showing general healthcare including weighing of infants and children, and dispensing of medicine. The dispensary proved extremely popular as there are notes to accompany this set of slides showing people were prepared to travel many miles and with their family and belongings in order to seek healthcare. As some of the slides may not have labels, some of the descriptions added may be rather basic. Some research was undertaken to try and improve descriptions where possible, but it is hoped more information can be acquired once the images have been made available online. As you can see from the reports above, there is often not a great deal of contextual information to accompany the slides. I have therefore decided to experiment with crowd sourcing in an attempt to enhance the slide descriptions. If you are able to assist in the identification of the people, or activities depicted in the lantern slides, I would be delighted to hear from you.